Avocado. Bone ash. Copper. Egg whites. Pumice powder. Sumac. Vinegar. Walnut. Some of the students’ creations. This isn’t some bizarre, arcane shopping list–it’s a sampling of just a few of the ingredients used by students in Kate Dimitrova’s Medieval Illuminated Manuscripts class. 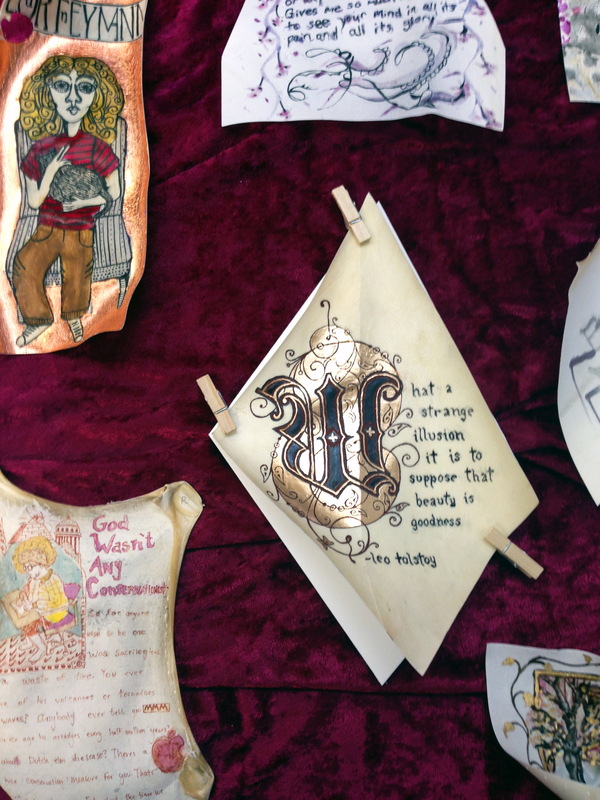 A few more modern materials, such as newsprint and coffee, pepper the list, but for the most part the students stuck diligently to their incredibly difficult mission–to create their own illuminated manuscript pages using techniques and recipes from the Middle Ages. Given the arduous process of producing their basic materials, much less designing and painting the actual illustrations, this was no small task. Each student was given a scrap of vellum to start with, then was directed to medieval recipes for pigments, inks, and even tools–some of which the students made by hand, as in the case of a home-crafted brush with human hair. 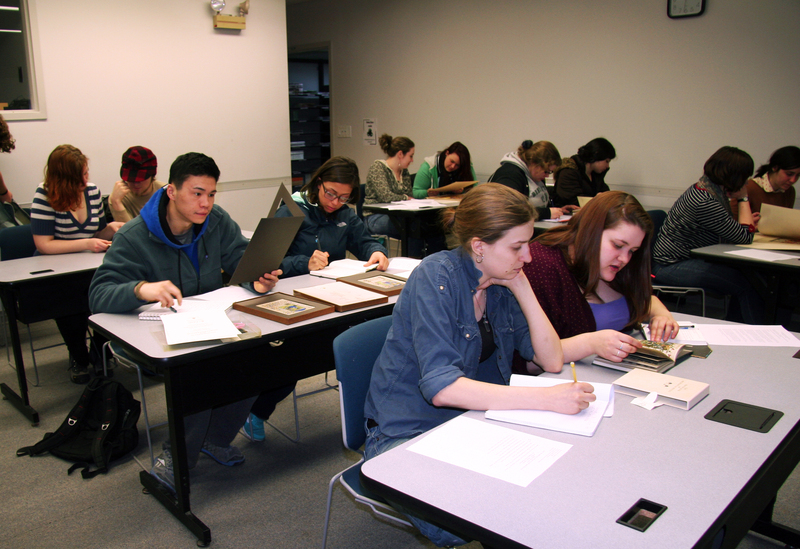 Students working with some of our manuscript facsimiles. When their works of art were complete, they were put into a display case here in the Scholes Library, and the students were given the opportunity to experience the next best thing to an original manuscript–high quality manuscript facsimiles. A facsimile is a very detailed reproduction or replica of an original manuscript, in this case medieval and Renaissance illuminated manuscripts. Though the specifics can vary depending on the quality and completeness of the facsimile, an ideal manuscript facsimile reproduces every facet of the original, from the cover to the uneven and sometimes torn pages. Facsimiles are valuable in that they provide the rare opportunity to experience the manuscript as it was intended to be experienced–not as a flat, disconnected projection on a wall, but as part of a whole work. Patrons who wish to see facsimiles from our collection can contact me, Eva Sclippa, at sclippa@alfred.edu, for a list of available facsimiles and information on accessing Special Collections. 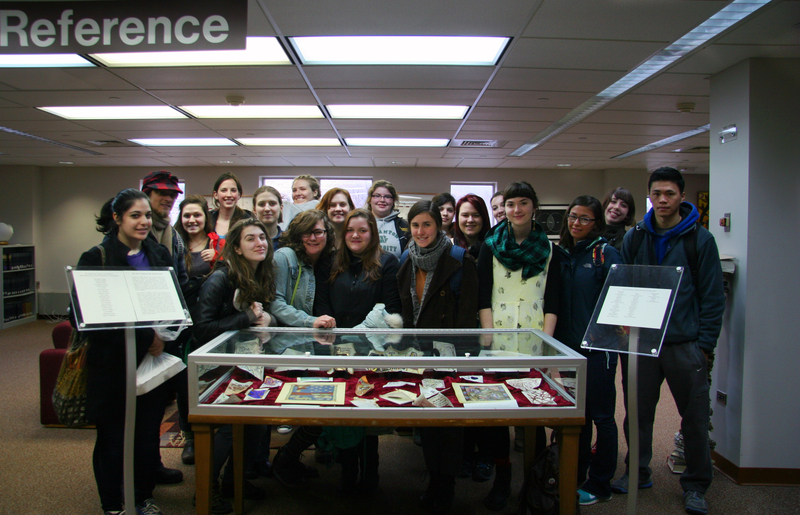 If you’d like to see the students’ beautiful work, it will be on display until April 30th, next to the reference desk–so be sure to get in before then! The full group with their works on display. Coral Lambert and one of her students, Lily Montgomery, have mounted a week-long art auction in the Book End Lounge. The auction will support a trip to the Pedvale Sculpture Park in Latvia this summer. Coral and her students will be building a large Earth Work Sculpture and participating in the International Conference on Contemporary Cast Iron Art. 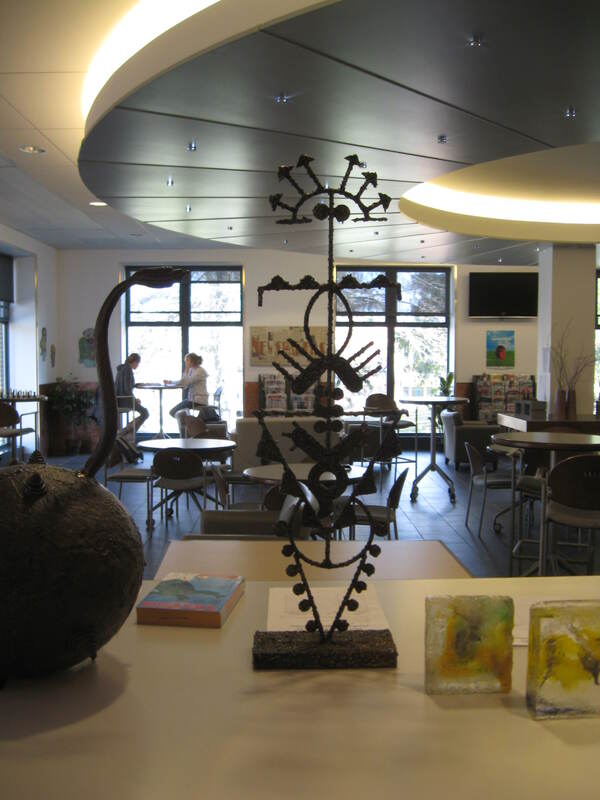 All are welcome to stop by Herrick Library to enjoy the art and/or to make a bid on any of the one-of-a-kind items on display. The auction will wind down on Friday, April 18th.